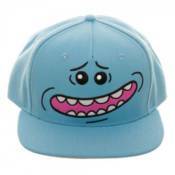 Rick and Morty Big Mr. Meeseeks Hat:Make sure your head doesn't disappear when you put on this incredible Rick and Morty Big Mr. Meeseeks Hat! Just sayin'. �We're not sure which of that race of blue humanoid creatures this is, but does it matter? Ages 14 and up.